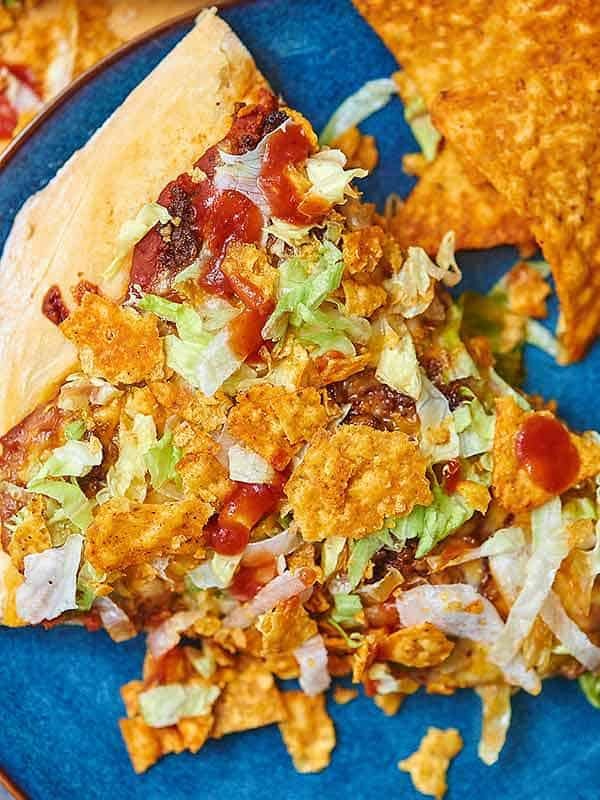 An easy homemade pizza dough topped with all your favorite taco toppings, this Taco Pizza with Homemade Pizza Dough will be a new Friday Night Pizza Night favorite! Yep! That’s right. 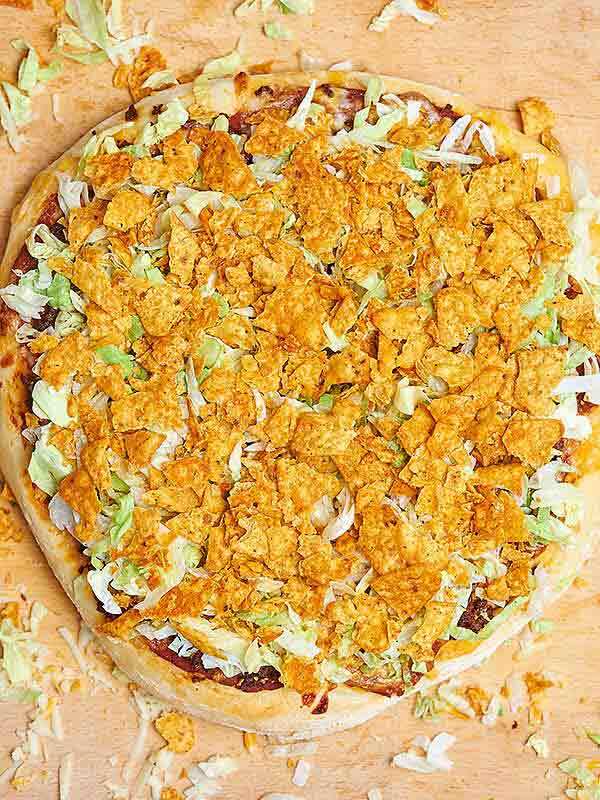 A taco pizza recipe. I’ve been wanting to do a “Taco Tuesday” post since I started, and why haven’t I? Ummm, that’s a great question, I have no idea. 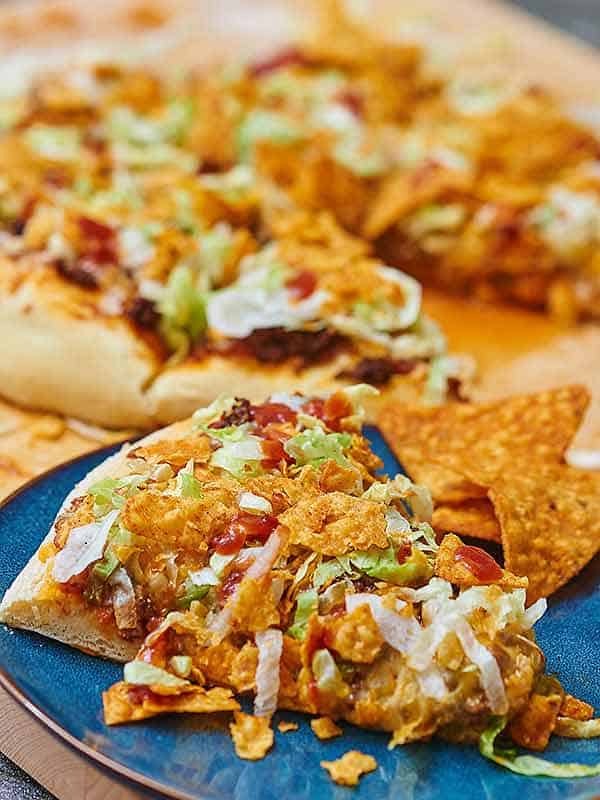 I’ve made this taco pizza recipe more than a handful of times and each time I make it, it just gets better and better! Homemade dough is topped with a pizza sauce made up of beans, taco sauce, and pizza sauce, two types of cheese (yes, two!! 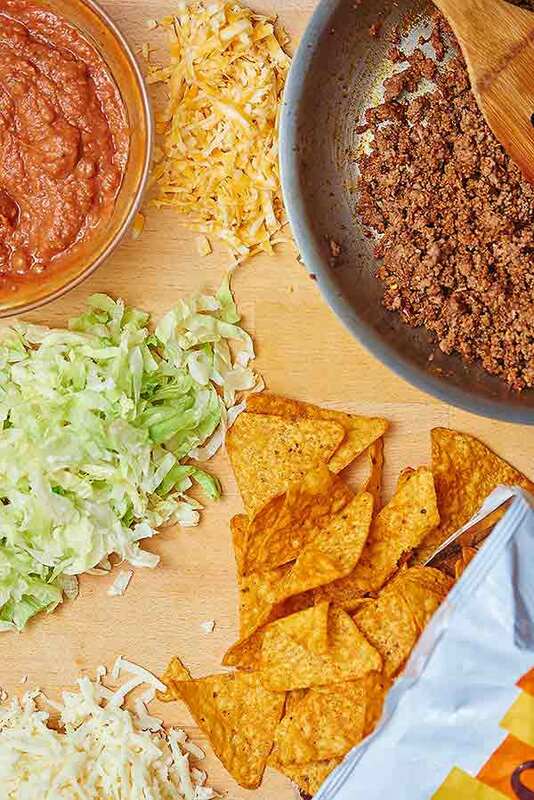 ), ground beef, lettuce, sour cream, more taco sauce, with…wait for it… taco-styled doritos! Yes that’s right, the good people at Frito-Lay created some type of “chip think tank” and out of it was born taco flavored Doritos! I’m not sure how much R&D went into it, but it was worth it. 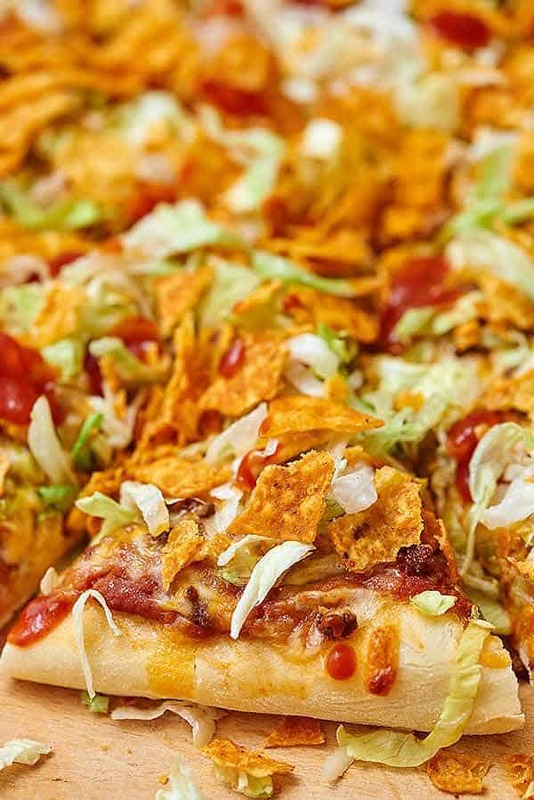 Have you guys had taco pizza before? It might just be a fabulous Midwest thing, like breakfast pizza! But if those are things are both new to you, then you should sign up for the newsletter above and to the right because I’m gonna keep ’em coming! 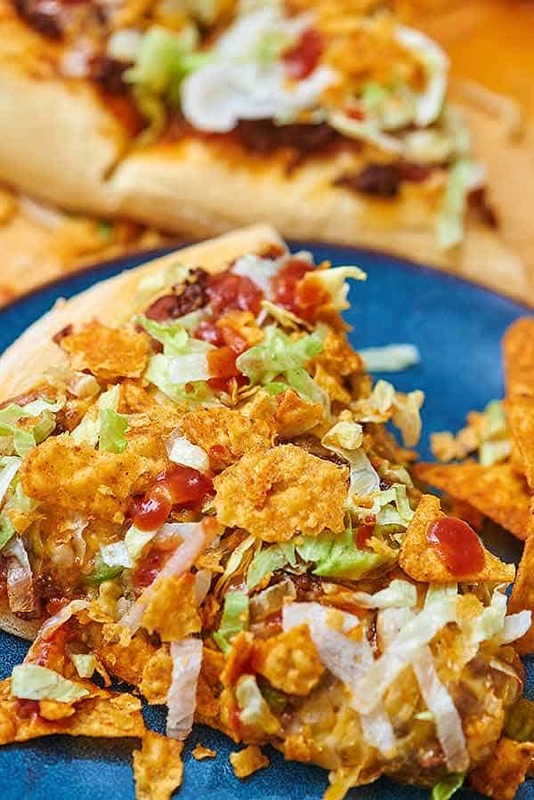 In Iowa, pretty much any restaurant that serves pizza will have taco pizza on the menu. Sunday’s were always pizza night in our household and Happy Joe’s was always my favorite. They definitely knew how to do pizza, but the best part about Happy Joe’s was that after you ate the most delicious taco pizza, you could go up to their ice cream bar, and have hot fudge ice cream sundaes. Pizza and ice cream go hand in hand in my book! You’re going to start by making the pizza dough, (Don’t let “homemade pizza dough” intimidate you, it’s easy), but before I even go there…let me tell you a little story. I, Jennifer Debth, am known for being an underbaker. Because, yum. That’s why. Cookies that are still gooey in the center, brownies that are extra gooey, cake – let’s not even bake it and just lick the bowl. Yes. Those can all handle my obsession with being all things oogey gooey, but let me go on record and tell you, pizza dough is not one of them. The first time I made this dough, I thought “oh, it’s just a liiiiiiitle bit sticky, I don’t want my dough to be dry, so it’ll be fine”. After the dough had risen, and I had rolled it out, and topped it with all these amazing topping….we couldn’t get it off the counter! We pulled and tugged, and finally it came off and went onto the pizza peel (btw – you need this). But wait! We’re not done yet. Then we….couldn’t get it off the pizza peel and onto the pizza stones . So we kind of, I don’t know, threw it onto the stones, and then the crust folded onto the top, so we had a stuffed-esque pizza in some spots, and then, and then, and then…it was a mess. Don’t get me wrong, it was phenomenal, but boy, was it ugly and messy. Start by dissolving yeast and brown sugar in warm water for 10 minutes. Then stir in salt and olive oil. Pour this mixture onto 3 cups of flour that have been measured out into a bowl. Dump the dough onto a well-floured surface. Measure out another cup of flour and slowly start kneading it in. As I said, the dough should not be sticky. 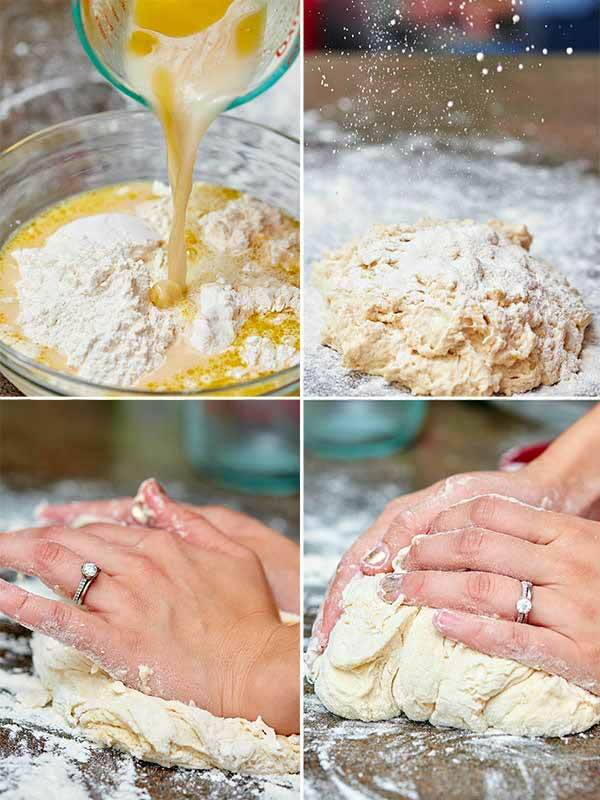 You may need more or less flour, so just keep kneading and adding the flour slowly until it’s no longer sticky. Place the dough onto a well oiled bowl, cover with a dish cloth, and place in a warm, dry place and let rise for an hour. I always keep my dough in the microwave so it’s out of the way! Take a moment to pat yourself on the back for making homemade pizza dough! After the hour is up, the dough should be significantly larger. Give it one good punch down, and then dump it out onto a lightly floured surface. Cut the dough into two. Place one ball of dough aside for later. Roll the dough out with your hands or with a floured rolling pin. 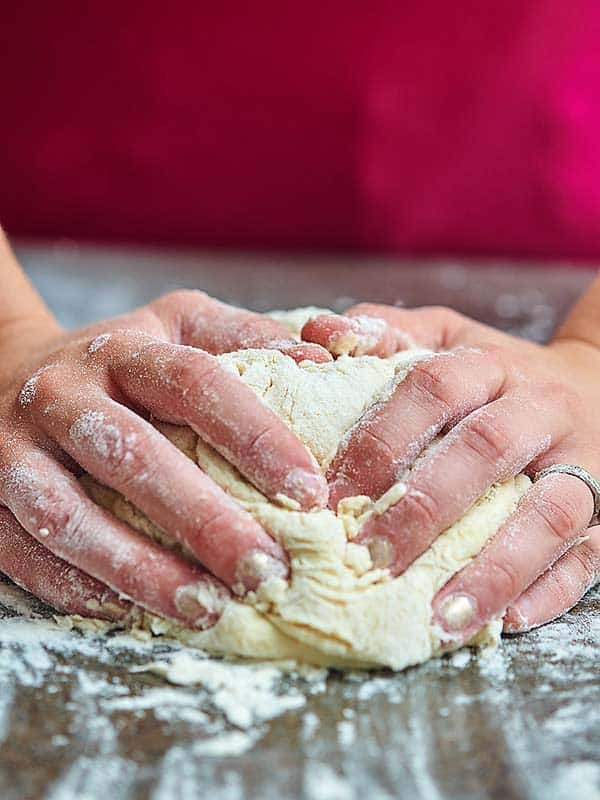 If you’re using your hands, gently press down and out onto the dough, until it’s a large circle! Our dough was about 1/2 in thick. Now top with your pizza sauce made up of beans, taco sauce, and pizza sauce. Make sure you leave enough for the other pizza! Top the sauce with mozzarella cheese, then ground beef (cooked until no longer pink, and then mixed with taco seasoning), and then colby jack. Again, make sure you leave enough of each ingredient for the other pizza! 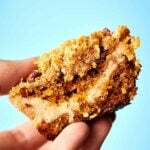 Bake this on top of pizza stones in a preheated 425 degree F oven for about 10-15 minutes, or until the dough is golden brown and the cheese is melted! Cut with a pizza cutter and top with desired topping! 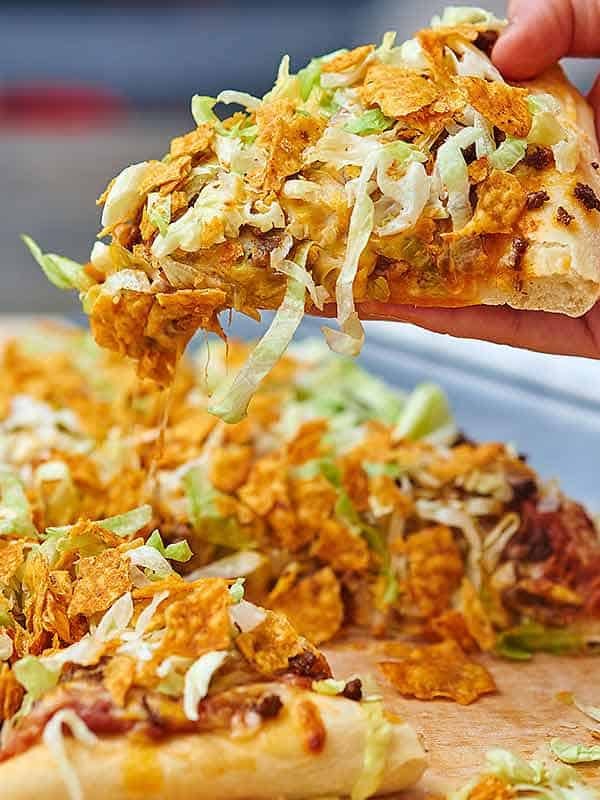 We always top with shredded lettuce, sour cream, taco sauce, and crushed taco flavored doritos, but the possibilities are endless! Repeat with the other pizza dough ball! The crust is perfectly fluffy with just a slightly crunch on the outside. The sauce is the perfect combination of taco-y bean goodness, but still tastes like pizza sauce. The cheese is extra cheesy, and I love the fresh shredded lettuce, and crunch from the doritos. 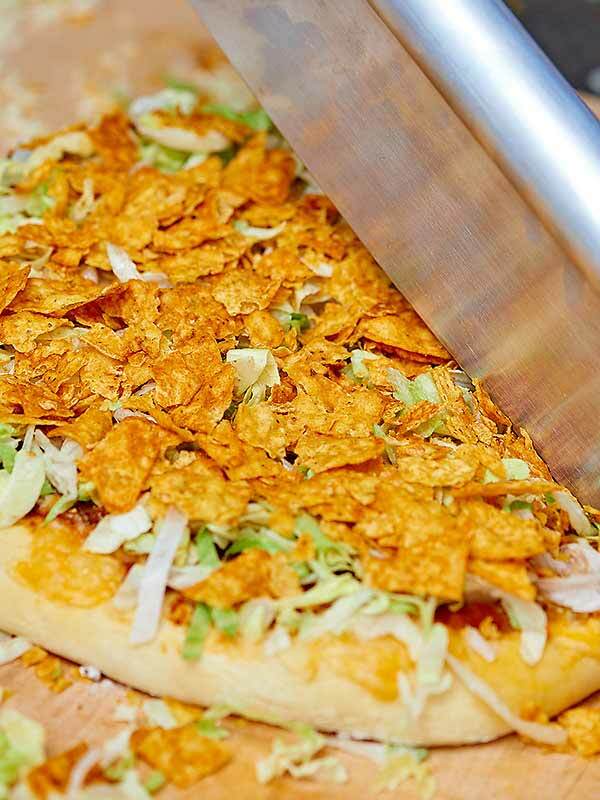 I mean, who wouldn’t love chips on their pizza?! Is it a pizza? Is it a taco?! It’s both! 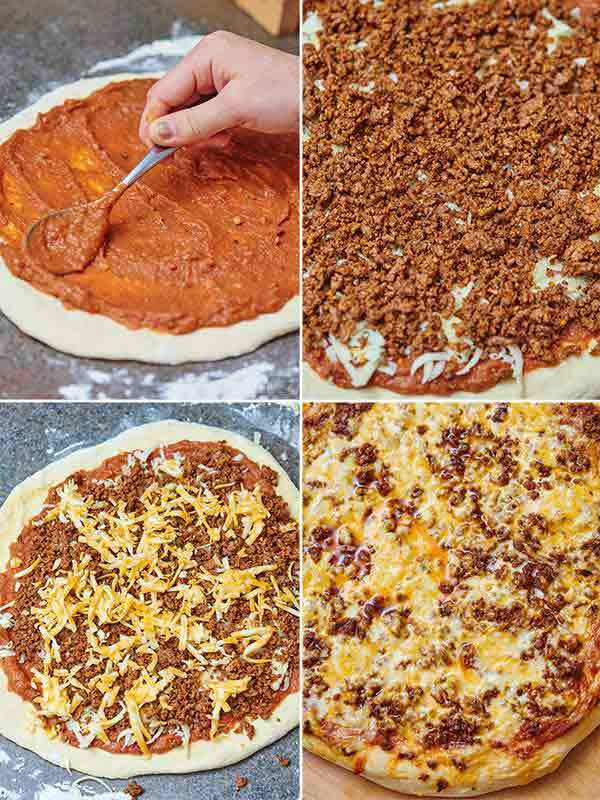 It’s homemade pizza dough with amazing taco toppings, and I just know you’re going to love it! 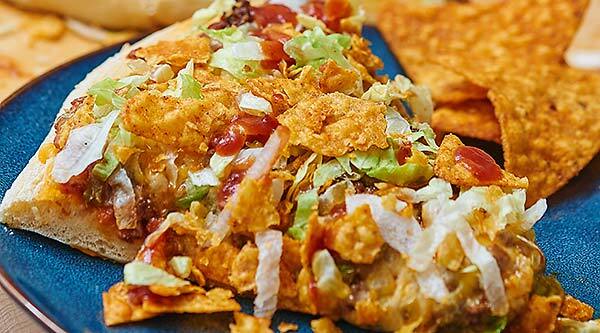 It makes a ton, so have some friends over for your next Taco Tuesday and blow them away with this taco pizza recipe! Start by dissolving yeast and brown sugar in warm water for 10 minutes. Then stir in salt and olive oil. Pour this mixture onto 4 cups of flour that have been measured out into a bowl. Dump the dough onto a well-floured surface. Knead until the dough is no longer sticky. You may need more flour, so just keep kneading and adding the flour slowly until it's no longer sticky. 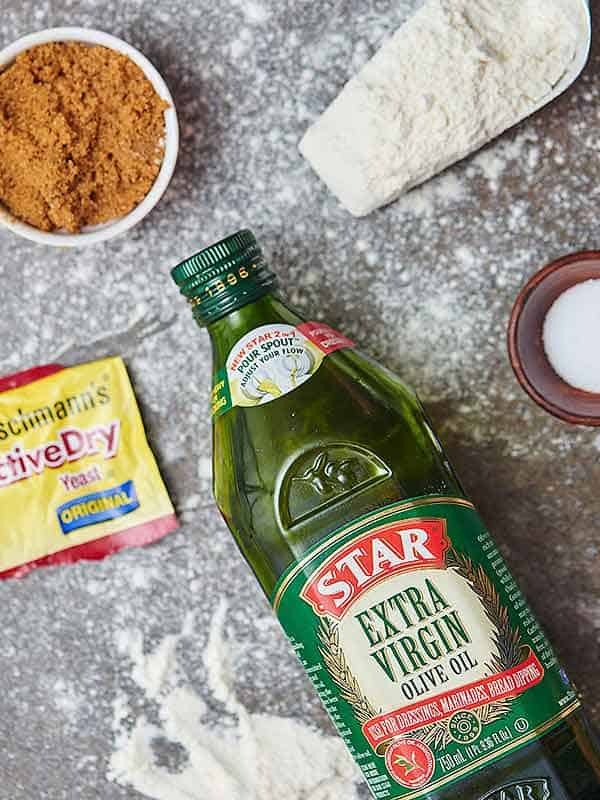 Place the dough onto a well oiled bowl, cover with a dish cloth, and place in a warm, dry place and let rise for an hour. I always keep my dough in the microwave so it's out of the way! After the hour is up, the dough should be significantly larger. Punch it down, and then dump it out onto a lightly floured surface. Cut the dough into two. Place one ball of dough aside for later. Roll the dough out with a floured rolling pin. Your dough should be 1/4 in - 1/2 in thick. 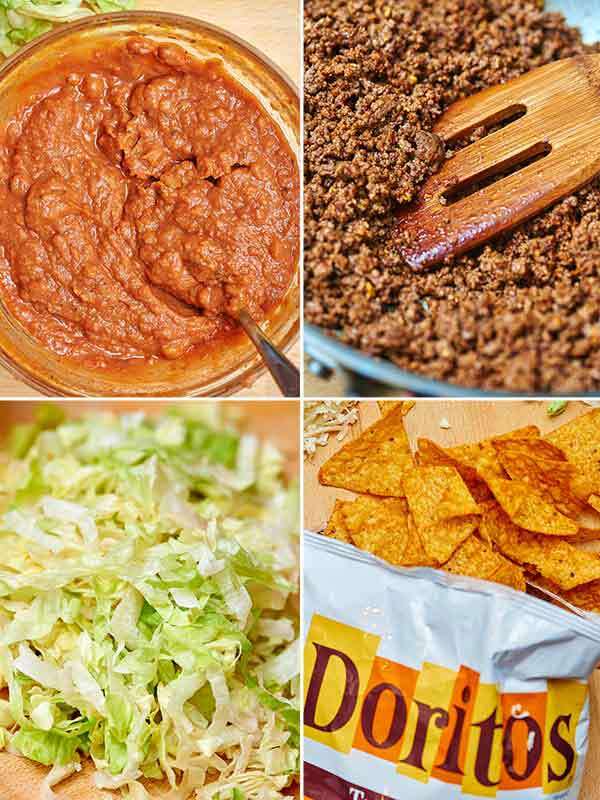 Mix together refried beans, taco sauce, and pizza sauce. Preheat oven and pizza stones for 15 minutes at 425 degrees F.
Top dough with pizza sauce. Top the sauce with mozzarella cheese, then ground beef (cooked until no longer pink, and then mixed with taco seasoning), and then colby jack. Make sure you leave enough of each ingredient for the other pizza! Bake this on top of pizza stones about 10-15 minutes, or until the dough is golden brown and the cheese is melted! Yea for Taco Pizza! I’m from Iowa and make homemade Taco pizza, too. We follow it up with this yummy desert pizza (also made with homemade dough). Yes!!! Trevor and I are in Seattle now and I miss Happy Joes like crazy! We’d always get their taco pizza and ice cream sundaes, of course! 😉 I hope you love it! Your water/flour/salt ratio is waaaay off in that crust recipe. That’s why the dough comes out super thick and bready. Try cutting the flour down by 25% and up the salt by a tsp for a more authentic pizza crust and less of a bread dough. Unless you like your pizza on bread– then do what makes you happy! Hi Lora! Thanks for letting me know. 🙂 I’ve made this crust quite a few times and it never comes out too bready/thick for my liking, but I’ll have to give your suggestion a try, too! How do you suggest I get the pizza onto the warm baking stone? Or should I just prepare it after the stone comes out of the oven? I wasn’t sure if the Dell would start cooking if I did it that way. Hi Angie! The stone gets heated in the oven and the pizza then cooks in the oven on the hot stones. The hot stones should not leave the oven. You can use a pizza peel to get the dough on and off the stones. 🙂 I hope that helps! Can i use pillsbury pizza dough? Hi Cassie! Yep! I bet it would be delicious 🙂 LOVE their dough. only thing missing is sausage. Happy Joes pizza has sausage and ground beef. Feel free to use both if you’d like! I recently started working making pizza and I love it. We use a pizza dry mix, add water to the mix and store covered in a walk-in fridge. We make probably about 30 buckets of dough a day (roughly 450 pizzas), so the bucket we grab has been in there maybe 3-6 hours. It comes out very easy to knead, but still quite stretchy. I haven’t tried chilling the dough at home yet, but I plan to soon. I’ll let you know how it turns out. 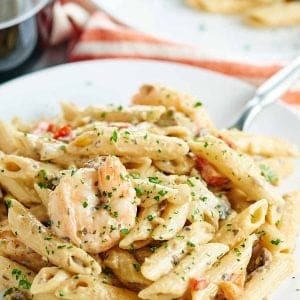 IS this sauce/topping recipe enough for the both pizzas or do you double it if making the full dough (2 pizza) recipe? hey jennifer…..i work at casey’s here in iowa……your taco pizza sounds good……we make our sauce by smashing up a can of refried beans(with chiles) and mixing with a tad of water to loosen….smear that onto your crust then smear a couple large teaspoons salsa over that…(or forget the water and loosen the beans with the salsa…then top with the meat and cheese and bake….. I don’t know why I never thought to Google taco pizza sauce before. Glad I did. I found your recipe and made it tonight. Had a great taste, we all loved it! I mainly just used your page for the sauce, but also remember how great Doritos are on top. Thanks for sharing your recipe!